I’ve been consternated lately about AQI – the air quality index. Basically, I’ve been watching the AQI for southern California on this website and I try to stay inside on days when it’s in the higher end of the “moderate” range. Rainy days tend to be better air quality days, but we don’t have a ton of those. While in Ontario two weeks ago, I was curious what the air quality difference between Los Angeles and Ontario is, so I looked up an Ontario AQI index. I found that while it seems to use the same numbers, the interpretation of those numbers in Ontario is a little different. If they’re using the same International AQI scale, then something is very wrong. Ontario says 50+ is poor. Southern California thinks it’s moderate! According to Health Canada, 4,200 Canadian deaths were associated with long-term exposure to poor-quality air between 1998 and 2000. That’s too many! More interesting tid bits about Canada’s AQI can be found here. Does anybody know whether the USA and Canada are using the same AQI scale? Without hockey there are no Canadians, only Americans that have wandered too far north. In the fall I had asked my mother to send me my 8mm film camera. She’d looked for it and then she and my father concluded that they’d accidentally thrown it out when they had cleaned out the basement in the summertime. They surmised that it was because the item was odd-looking and they might not have been sure of its purpose. So they assumed that they’d tossed the allegedly unidentifiable item instead of contacting me to see if I knew what it might be. So they’d tossed it. Too be sure, I was disappointed; but I held a healthy scepticism that they simply might not be able to find it and were assuming that they’d thrown it out so they wouldn’t have to keep looking. I went home this past weekend to surprise my father for his birthday. Among other sub-objectives, one was to pack up all my “stuff”. 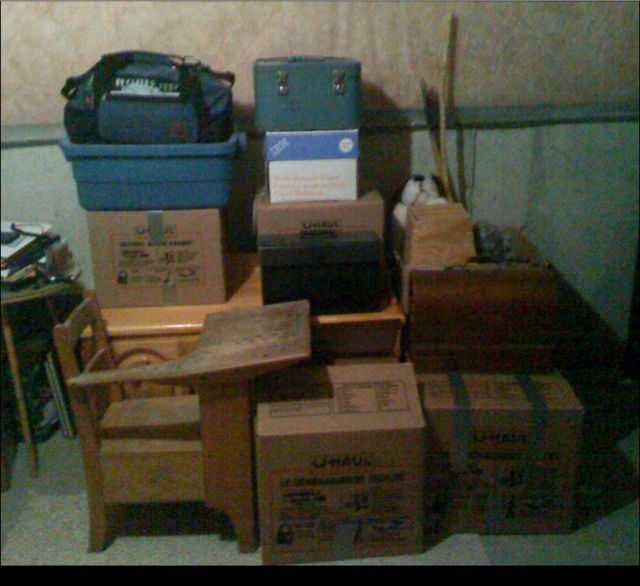 After not living at home for over six years I still had lots of my things all over the basement and “my bedroom”. While I was going through stuff, I came across my film camera! Yay!! Here’s my stuff. Ready to move… somewhere. Who knows where? It might be a house in LA. It might be the east coast. It might be Switzerland. Only God knows, eh? We wait for word. And my parents wait for word on where to send my stuff. Thankfully, in the meantime, they won’t likely think that they’ve accidentally thrown away anything else of mine, since it’s all neatly packed in one place now. It’s mine. Don’t touch it! Ryan Reynolds is the Canadian! Further research reveals that not only is Bullock American, she was born in a suburb of Washington, D.C.! Here’s a video of a high speed police car chase that I got from Richie Book! Just in case you were wondering, this blog should help!